Back in the early days when the nation’s capital was in Philadelphia and the radical founders were declaring independence, the Liberty Bell cracked when a peal of utopian idealism reverberated through its hardened casting. The irony of discord is astounding and attracts millions of onlookers inspired by this symbol of resilience. But there is a new clanging reverberating from the politics of America that is splintering the nation into shards of distrust, anger, and intolerance. The clapper, so to speak, that strikes against the walls of our fragile liberty, is the TRUMPIAN deep divide of racism and hostility, opening a new gaping crack across the country. Despite the fact that one of the key tenants of the Constitution was “all men are created equal,” the lack of equality professed by TRUMP’s electorate in respect to race, religion, gender and sexuality is rattling any sense of accord that may have once existed. The crack between white and black, men and women, straight and gay, Christian and Muslim is creating a resounding peal of discord echoing through the voices of the media. The Trump clapper is a wildly agitated instrument of force with no other intent than to strike the bell into a million shattering fragments. It is no wonder that the religious and racial wars seem to be intensifying as we move headlong into the political season. By the time the convention tour travels to Cleveland and then on to Philadelphia over the next two weeks, we can only wonder how much brotherly love will survive. 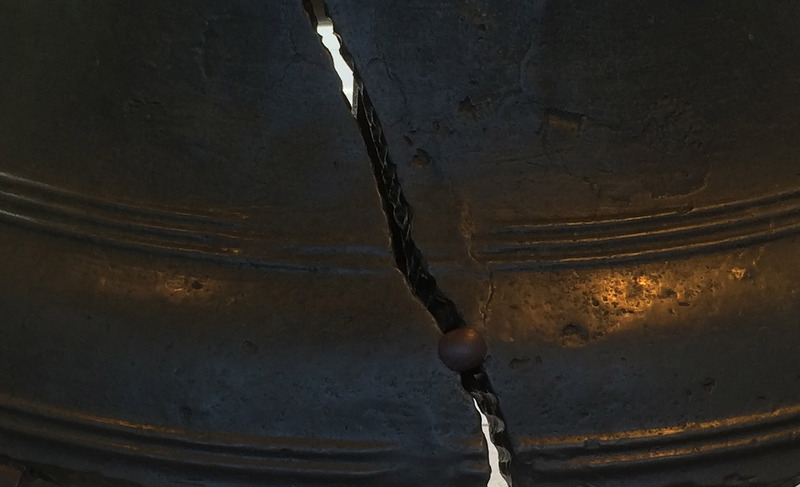 The Liberty Bell stands as a reminder of the fragility of democracy, it’s crack a gaping wound that will only fester and ooze more blood with the current climate of uncontrolled hostility. Let us hope that there is still enough reason in the populace to strike a resonance of civility that will insure the proverbial bell of liberty continues to ring.